Click here to Claim Your Free 3 Years Warranty! In the office, at home or on the move the stylish P-215II has true plug-and-scan convenience. It is the fastest, portable scanner with duplex scanning speeds of up to 30ipm. The imageFORMULA P-215II is the most productive scanner in its class. With double-sided USB-powered scanning up to 30ipm and a 20-page automatic document feeder users can scan efficiently, in the office, at home or on the move. 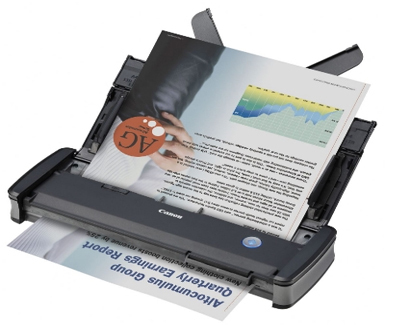 The P-215II has a strong robust design for handling up to 500 documents a day. With card scanning becoming increasingly important for ID authentication, the P-215II has its own dedicated card scanning slot. A sophisticated switchback feed mechanism ensures it quickly scans ID and embossed cards. The P-215II uses both ISIS and TWAIN drivers to allow for easy integration with your standard imaging application and includes a full-suite of software applications to help users work more effectively. The intuitive icon-based user interface of the bundled CaptureOnTouch software makes scanning quick and simple – while the Full Auto Mode function automatically applies the best settings for each scanning job. PageManager (Mac) and PaperPort (Windows) provide effective file management and conversion tools; while scanning business cards has never been easier with the BizCard application. For the freedom to scan wherever you are, combine the P-215II with the optional WU10 Wi-Fi and battery unit. Use it to wirelessly scan documents directly to your smart phone, tablet or desktop PC, or share the scanner amongst a group of users or devices via a network server or home router. With a smart, compact design, the ultra-lightweight P-215II is ideal for both users on the move and in the office. Its small footprint allows the scanner to fit comfortably into travel cases and onto busy desktops. True plug-and-scan is possible by simply connecting the scanner to any PC or Mac. Canon’s unique built in CaptureOnTouch Lite software is ready to go – without any need to load drivers or application software. Advanced technology allows for high precision scanning up to 600dpi. A rich range of image processing features, such as auto colour detection, auto text orientation recognition, ensure superb scan quality that is ideal for creating searchable PDFs using OCR. Thanks to the bundled plug-ins, users have the option to scan direct from CaptureOnTouch to a range of cloud services, including Evernote, Google Drive™, SharePoint, SugarSync, DropBox and OneDrive. This allows information to be quickly uploaded to the cloud, for anywhere, anytime access.